The Rubicon Trail in South Lake Tahoe connects two of the most beautiful state parks in all of California, D.L. Bliss, and Emerald Bay. For years I have wanted to hike this trail, but since I do not get to Tahoe as much as I would like, it has taken me a while to finally complete it. I can easily say it was worth the wait though and this 5-mile trail (one way) is now one of my favorite, approachable trails in California. Here is all the information so you can do it as well. Get there early as both lots fill up fast. I would recommend before 8:30 AM, especially on weekends and during the summer. One of the best ways to experience this trail is to get a few friends and a second car. Park one car at D.L. Bliss, in the back of the park near the trail head and park the other at Emerald Bay. This allows you to hike the trail as a 5 mile one way instead of a 10 mile out and back. I also thought that I might be able to get a Uber / Lyft when I went, but the reception was really spotty for me, so I would not rely on that, at least not with AT&T. Also, the trailhead is way in the back of D.L. Bliss so if you got dropped off near the entrance you would have to walk about a mile to a mile and a half to get to where the trail starts. I like starting the hike from D.L. Bliss as Emerald Bay is a great place to relax by the water, so it is fun to end there and hang out. The trail starts in the back of the park near the lot for Calawee Cove Beach. This is a tiny lot so get there early. The trail heads out from right next to the lot, and it makes its way around Rubicon Point before starting to head south towards Emerald Bay. The trail goes along the water 80% of the time, with great views around each bend. You will begin walking along a small part of the trail where the granite encroaches over the trail itself, and there is a metal chain that keeps you from falling off. It’s not sketchy or anything though. It then crosses a few small bridges which help you traverse some of the less flat parts of the trail. The trail is rolling, so there are a lot of ups and downs but no real long sections of uphill or downhill. When you come around the corner, you will reach this overlook which provides a fantastic view of the mountains ahead of you. I think this is Mt Tallac, but I am not sure. The trail continues along the coast with magnificent views stretching out in front of you. You will then cross into an interior section at about the one-mile marker. This is where the trail meets up with another path that leaves from the Lighthouse parking area in D.L Bliss State Park. From here you will be walking under trees through an inland portion for about a half mile. There are a few small water crossings along the trail but nothing you can’t hop on a few small rocks to get over. The trail then comes back out to the coast for what is probably my favorite part. This series of ups and downs, as you make your way towards Emerald Point, are just majestic with views for miles out ahead of you. You will see boats and jet skis in the water, and it made me wish I had a boat to come over here as well. At the end of this section there is a steeper uphill piece for a tenth of a mile, and then it goes back down on the other side. When you arrive at Emerald Point, you will see a small cove that people like to sit at for lunch. It is pretty, and there are often boats sitting in the cove as well. I didn’t see a good way to go out to Emerald Point, so I kept going on the trail as it headed inland toward the state park. After another half mile, you will reach the boat camp, where there are camping sites and where you can dock your boat to explore the bay. There is a pier here as well. As you leave this area, you will get your first view of Fanette Island, the small rock outcropping in the middle of Emerald Bay with the historic Tea House on top of it. You can also see Vikingsholm which is the mansion/castle at the bottom of Emerald Bay in the distance. The trail continues past Parsons Rock before arriving in Emerald Bay proper. This area is a great spot to relax at, especially if you brought a second car here. Do note it is a tough uphill to get out of the bay and back to the parking lot though. 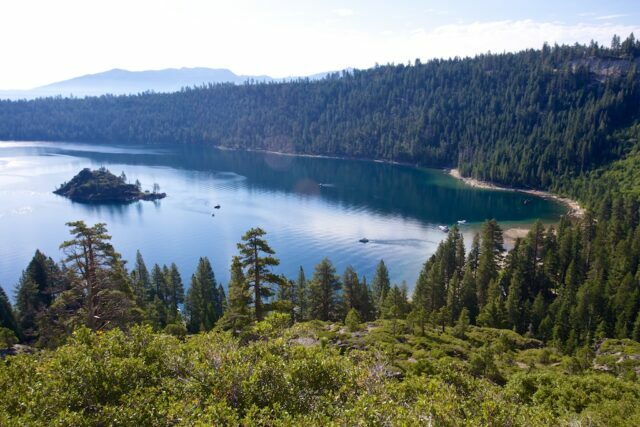 Here are a few recommendations for what to do in Emerald Bay. If you didn’t bring a car, then you will want to head back the way you came to DL Bliss. Be sure to stop by the visitors center and grab a popsicle before heading back though. Here is a video I made on the trail as well. As you can no doubt see, this is a fantastic California hike. Be sure to check it out and let me know what you think if you go in the comments.